PayFlow Pro is a multi-threaded payment processing environment that receives requests and transmits it securely to our processing networks for real-time authorizations and returns a transaction receipt to the server during the same session. It is fast, robust, and scalable. Built-in security features reduces fraud and a complete suite of reporting capabilities help you manage your online sales. Supports acceptance of Mastercard®, Visa® American Express®, Discover® and ACH checks. PayFlow Pro is configurable to any e-commerce application and ideal for enterprise merchants who require a complete custom and controlled buyer experience. It can be integrated as an application library or can run using CGI scripts. 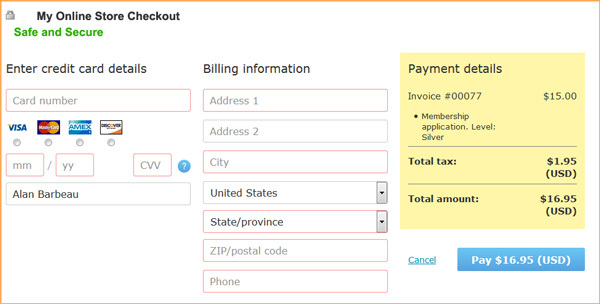 It also supports Recurring Billing for a scheduled payment solution with a fixed ending period. PayFlow Pro is integrated with the majority of third-party shopping carts and e-commerce applications and supports many processing platforms, including FDMS, Global Payments, Nova, Paymentech, and more.